Remittances tend to dominate any conversation of Africa. 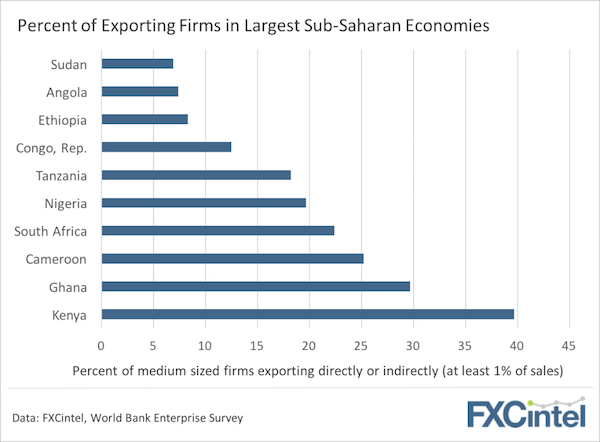 But African exporters (shown below) and exporters* to Africa are too often overlooked. As you can see, international trade is a significant part *of business activity in these country’s economies. The risks of doing business with these volatile currencies provide excellent hedging opportunities. Specialists such as INTL FC Stone or Ebury who often combine trade finance or commodities expertise into the mix have been making good in-roads into these opportunities. As the African economy continues to expand, we would expect to see more players develop products to serve this market.